Want to discover a little more? We invite you to tour this impressive project with us. Let's start the tour with the front of the house. 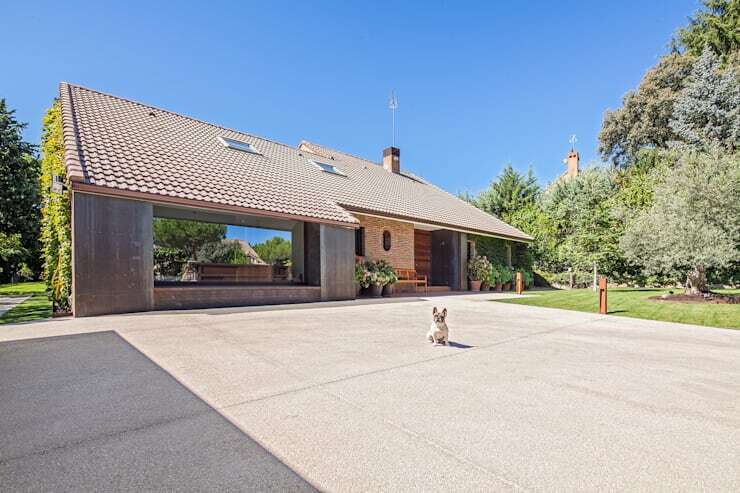 The exterior takes the form of a traditional home with a sloping tiled roof, chimney, and surrounding garden. However, we can already see some details that tell us this house will have a modern and unique interior. That large rectangular bay window is stunning, especially with the mirror insert that maintains the owner's privacy while allowing them to look outside. Then there's the pop of wood on the left. So far, its very promising. When we step inside we find a tall living room that opens up to reveal a loft. That huge wooden parquet links the two floors together, creating an architectural centerpiece that looks amazing and grounds the loft. In the living space the decor has simple modern lines especially in that bright blue on the couches. The glass furniture gives us a glimpse onto the thick beige carpet that seems to stretch on and on. 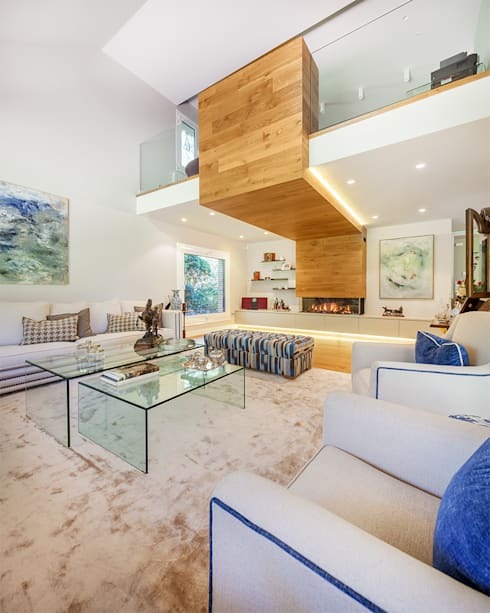 This living space makes a huge impact. In the dining room, there is another glass table that adds some elegance to the space. The modern contrast between the warm wood parquet flooring and the white walls is softened by the table legs. They have a shade just between the wood and walls that combines the fresh and warm characteristics of both. The lighting along the floor beneath the shelving makes the whole room vibrant and lively. The kitchen, like the dining room, has no partition, but is open to the rest of the home. 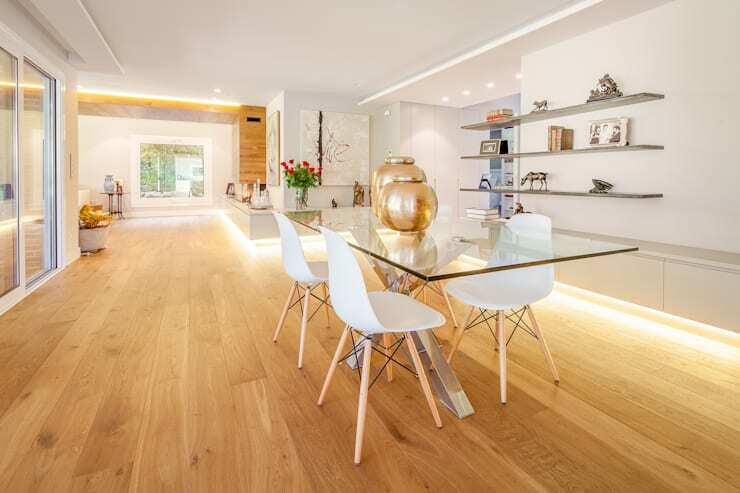 It has the same wooden floor as the rest of the house providing a feeling of continuity. All of the furnishings are white, along with the ceiling and walls. The dramatic black edging around the skylight draws your attention up to this amazing feature. If you're looking for a kitchen that feels as modern as this one, but has more cute character to it, check out these nine delightful kitchens. 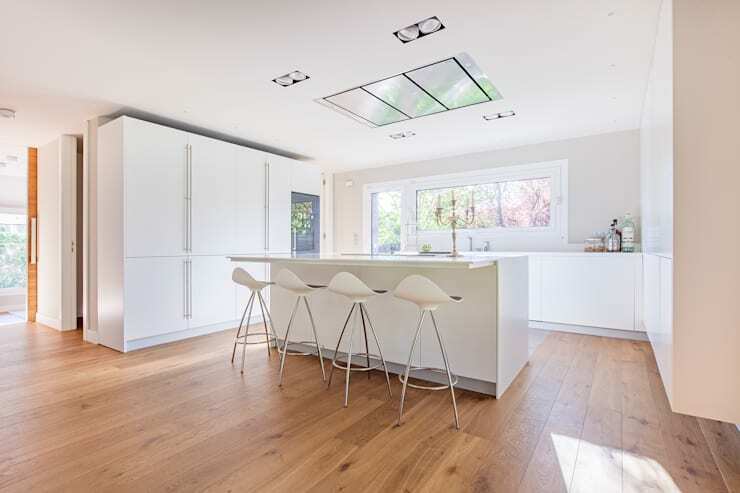 If you were worried about that gorgeous parquet flooring in the kitchen, the designers have cleverly hid some more suitable flooring behind the kitchen island. This touch concrete is easy to clean and won't be damaged by moisture. 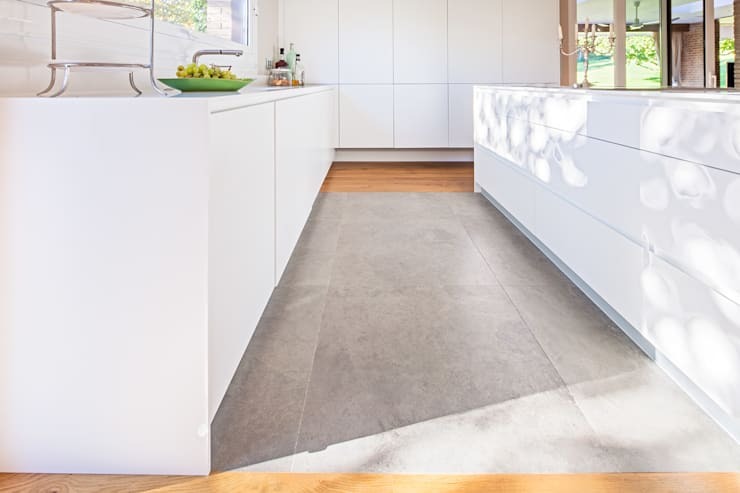 Like many flooring changes it also gathers together it sits beneath, creating a feeling of unity in the cooking space. For advice on the properties of different floors and which can work best for your space talk to one of these professionals. This bathroom has the same wood and white combination, and it works wonderfully here as well. 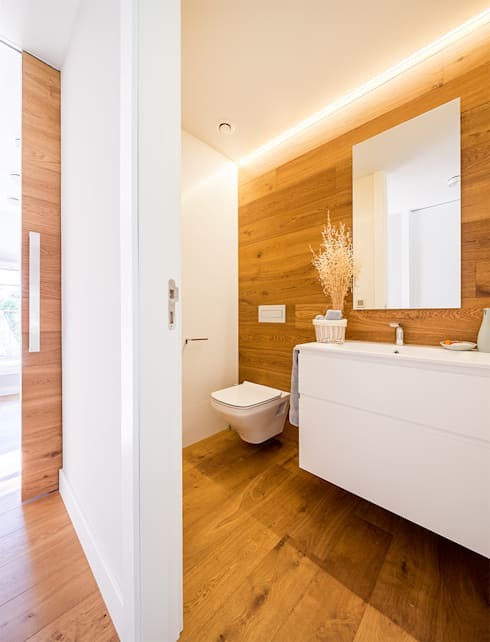 Wood in bathrooms is becoming an increasingly popular choice, because of the warmth and the comfort that it provides to a space that is often too cold and plain. By keeping the far and separating walls white the designers have kept the wood from feeling overhwleming in the small space. 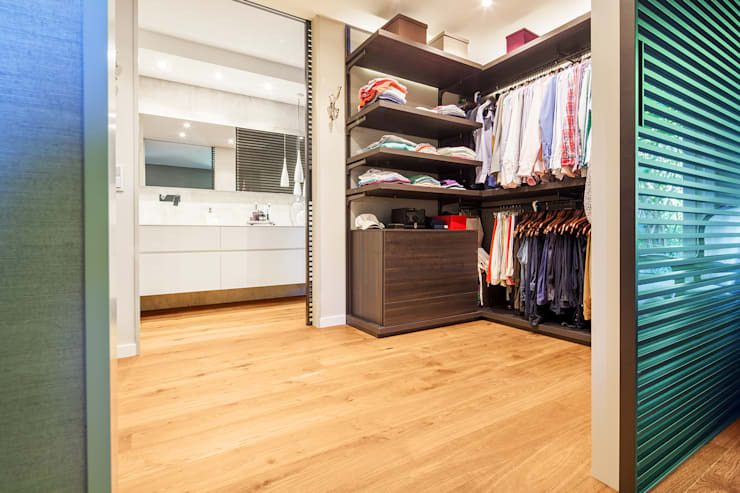 This dressing room is so spacious it acts as a connection between the master bedroom and the master bath. The use of the double railings to allow or stacking hanging storage is brilliant. It can be frustrating to always be bending over for the folded clothes, but this was your favourites can be at eye-level whether they require hanging or folding. A sweet lilac has been added to the white and wood them to make this space more comfortable for children. Each child also gets their own fuzzy carpet that acts as their separate play-space. Quarreling is kept to a minimum with the identical beds, shelves, and lamps. The mirrored furniture also creates symmetry in the room, making it as beautiful as it is practical. If you enjoyed this take on the white and wood combination you'll love this apartment that gives the classic combination a stunning twist. Which of these rooms inspired you the most? Let us know why in the comments!